The March blog post “Sleuthing in Rare Books to Reveal and Art Lover’s Interest” presented the collection of William Barnes Bement (1817–1897). Bement was a prominent Philadelphia industrialist and avid art collector. However, his descendants sold off his art collection shortly after his death. The only remaining record of his holdings is a leather-bound and illustrated publication in Winterthur’s collection, Catalogue of Works of Art, with Illustrations and Descriptions; Also, Views of the Summer and Winter Homes, Etc. of William B. Bement. Louis Claude Mouchot, Sortie of the Grand Council, 1872, reproduced in Catalogue of Works of Art, with Illustrations and Descriptions; Also, Views of the Summer and Winter Homes, Etc. of William B. Bement (Philadelphia, 1884). Looking at the images of works and interior views presented in the catalogue, the post discussed the relative importance of different artworks for Bement. 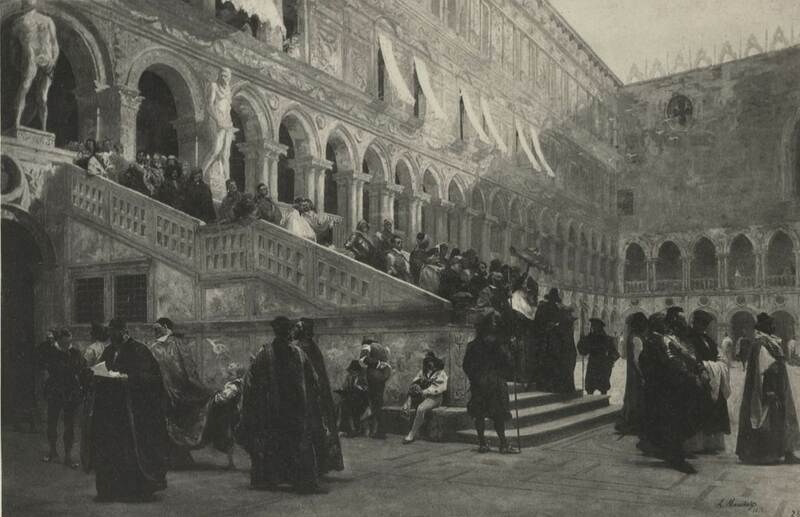 Based on its location in his home, French artist Louis Claude Mouchot’s Sortie of the Grand Council (1872) seems to have been one of his favorites. The location of this painting was—at least according to some basic online searches—unknown. As a result of the blog post, two separate people reached out to me about the provenance and location of the painting. One of these people was the current owner! The painting, thanks to the previous blog post, has been located and now has an almost-complete provenance. Mary Anna Webb, a professional art researcher with Montchanin Art Research and a former business and marketing director for AskART.com, reached out to me to report that she was able to trace the Sortie of the Grand Council from the sale of Bement’s collection at the American Art Association in 1899 (the catalogue of the auction is available here). It was sold to “Edward Payson Bacon for $510—another wealthy industrialist,” wrote Webb via e-mail. Bacon was one of the wealthiest men in Milwaukee, Wisconsin. His biography is given five pages in Memoirs of Milwaukee County: From the Earliest Historical Times Down to the Present (1908). Webb believes the painting stayed in the Bacon family until at least 1930, when his second wife Ella died. After that, the trail went cold. A month later, I received another e-mail about the blog post. This time, it was from Betsy Craig, sales director at Rosenbaum Contemporary gallery in south Florida. She is the current owner of Mouchot’s Sortie of the Grand Council. She purchased it at Spanierman Gallery in New York City. Renowned art dealer Ira Spanierman, who had the painting in his private collection, told Craig that he had purchased it at “a small auction somewhere many years ago.” It seems that auction may have taken place in Milwaukee. The provenance and fate of William Bement’s favorite painting is known—and it has a happy ending. This entry was posted in Academic Programs, American Culture Studies, art collections, Art Conservation, Library, museum collection, rare books, Uncategorized and tagged paintings, rare books, william bement, Winterthur Garden, Winterthur Library, Winterthur Museum Garden & Library. Bookmark the permalink. Various art pieces connected to Monhegan Island Maine are showing up in garage sales & thrift stores here. One bears the name R. Clay Kent, ISMP and the other is Verger du Provence by Vincenth and has a stamp on the back Alex Minewski, with an address and marking GR. 5-6537. Apparently Alex summered in Monhegan Island. I’m interested in knowing why the Vincent piece has an Alex Minewski stamp. It is obviously very old.